Home > Great new price on Brockway Springs lakeview condo! Leave all of your worries behind when you come to these stunning Lake Tahoe views at Brockway Springs. Relax inside this luxurious condo or unwind while sitting out on the deck taking in views of the lake. 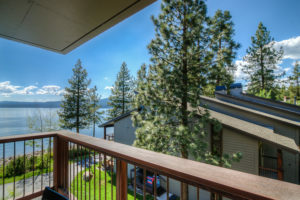 Widely regarded as the premiere condo complex on the North Shore of Lake Tahoe, Brockway Springs Resort offers activities and amenities for everyone in the family to enjoy, year-around. Brockway Springs Amenities: Heated pool, tennis courts, pier, kayak & SUP storage, group entertainment facility, and fitness center are just some of the many options to enjoy! Brockway Springs Rental Management offers full-service in-house property management if you rent your condo, and they promote accommodations on their website. The North Shore of Lake Tahoe offers hiking, biking, beaches, restaurants, bars, shopping and much more! This area that spans from Kings Beach to Tahoe City on the CA side of the lake, generally has more sun and less snow than other areas around the lake – Starting in Tahoe Vista and going east is known as the “sun belt”. In the summer months the streets, trails and beaches are filled and the communities are bustling. Ride your bike along the 3-miles of paved path that goes from Dollar Point into Tahoe City, for a day of shopping in the boutiques around Tahoe City or a round of golf. During the peak winter months you will find people ducking in and out of ski/snowboard rental shops, cozying up by a fire with warm drinks and a fun festive atmosphere. Tahoe City and Kings Beach both feature outdoor activities during the warmer months such as, concerts in the park, farmer’s markets and movie night in the park. You’ll find multiple points where you can launch your boat for a fun day on the lake!